At nearly 10-years-old, 7HO10999 Regancrest-GV S BRADNICK-ET and 7HO10920 Mr Chassity GOLD CHIP-ET earned higher classification scores from a committee of Holstein Association USA classifiers last week. BRADNICK, now Excellent (96), and GOLD CHIP, now Excellent (95), have been long-time favorites in Select Sires’ Showcase Selections™ lineup. Known for siring show-stopping daughters around the globe, BRADNICK (+2.47 PTAT, +2.68 UDC, +2.47 FLC) and GOLD CHIP (+2.31 PTAT, +2.22 UDC, +1.80 FLC) are extremely popular with high-Type enthusiasts. “We have been blessed with many high-scoring bulls in Select Sires’ history but BRADNICK is an extraordinary individual and a true customer-satisfaction sire. He sires daughters with great balance and a will to milk,” says Kevin Jorgensen, senior sire analyst. BRADNICK was bred by Regancrest Farm and Todd and Brad Groves of Waukon, Iowa. He is a 7HO8190 SANCHEZ son of Regancrest Breya-ET (EX-90-EX-MS-GMD-DOM). His second dam is none other than Regancrest-Pr Barbie-ET (EX-92-EX-MS-GMD-DOM) and the next six dams are all Excellent or Very Good. “Like his daughters, GOLD CHIP continues to develop into an amazingly stylish individual and looks half his age—such a youthful bull at nearly 10-years-old. Few sires have brought home more champion banners than GOLD CHIP,” says Jorgensen. GOLD CHIP was bred by Ernest W. Kueffner and David R. Dyment of Boonsboro, Md. He is a Goldwyn son of Regancrest S Chassity-ET (EX-92-EX-MS-GMD-DOM) and another descendent of the famed Regancrest-Pr Barbie-ET (EX-92-EX-MS-GMD-DOM). 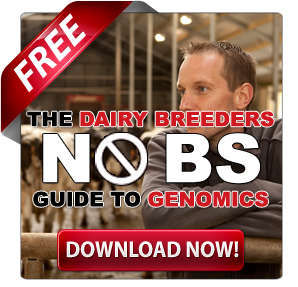 “Both BRADNICK and GOLD CHIP embody Select Sires’ belief in great cow families and its value in genetic development. We’re honored to work with the breed’s greatest cow families and the exceptional breeders that have created them,” says Jeff Ziegler, vice president of dairy cattle breeding. Caption: (Top Photo) Holstein Association classifiers Brad Heinzman and Dan Cnossen providing the committee’s stamp of approval on the new classification scores. Source: 0419 CDCB/HA Genomic Evaluation: BRADNICK and GOLD CHIP Type Rel % 99. ™Showcase Selections is a trademark of Select Sires Inc.
Quality Holsteins from Woodbridge topped Holstein Ontario’s annual highest classifying herds with an average final score of 86.14. The top 20 herds with 60+ registrations per year are recognized below. Siemers had an Excellent classification day recently with a total of 65 NEW Excellent cows! There were also 205 new VG cows of which 95 are NEW VG-2Y Olds. There were also two MAX score 94-4Y Olds, four new 93-point cows, and a MAX-92-3Y Old. LIDDLEHOLME RESUR LU is the breed’s newest 97-point cow! The newest EX97 cow of the Holstein breed is Liddleholm Resur Lu! She is owned by Anthony Liddle of Argyle, New York. Lu is a Resurrect daughter out of EX91 September Storm x EX90 Mandel. 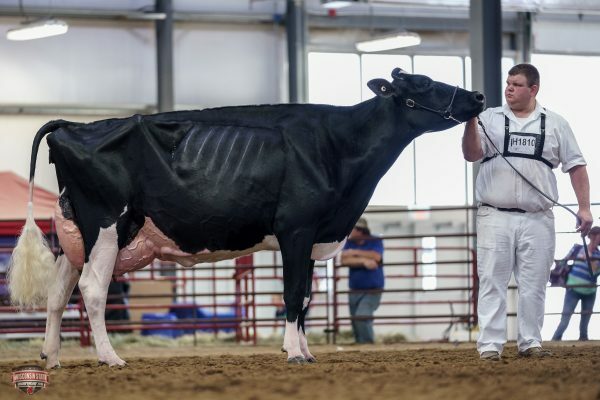 She has enjoyed great success in the showring through the years and shown above she was the first place 150,000 pound cow at the 2018 International Holstein Show in Madison, Wisconsin. Congratulations to Anthony Liddle and Liddleholme Holsteins! 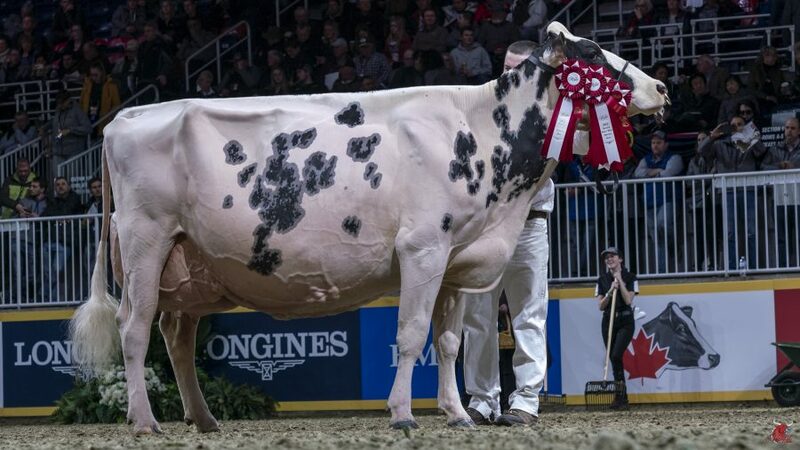 On January 31st Jacobs Lauthority Loana became Canada’s newest Excellent-97 point cow. Bred by Ferme Jacobs Inc., Cap-Sante, Que., Loana is owned by Ferme Jacobs and partner Pat Conroy, Angola, Ind. As a mature cow last year, Loana was grand champion at the International Holstein Show, first and reserve grand champion at the Royal Winter Fair’s National Holstein Show and a class winner at Le Supreme laitier. This Comestar Lauthority daughter was All-Canadian mature cow in 2018 and Reserve All-Canadian 5-year-old in 2017. Co-Vale Dempsey Dina 4270-ET has officially joined the EX-96 club! Congratulations to MilkSource Genetics team and Ransom-Rail Farm. A total of six 2-year-olds scored VG-89 in the US in the last month. Diamondback-Advent leads the way producing 2 of the 6 with Hillrose Allie-Red and Milksource Taekwondo. The list also includes another red heifer, Flower-Brook Coral-Red (Avalanche-Destry), as well as Hammertime Revalee (Absolute-Goldwyn), Cookiecutter Habitan (Delta-Day) and Heart&Soul Glitz (Dempsey-Goldwyn). Al-Lew Monterey Ashley 1346 received the maximum classification score, VG-89, for a 1st lactation cow in the USA. Ashley is the highest scored cow right now in the breed with a direct son in the global GTPI Top ranking. She is the dam of the popular sire Aristocrat (GTPI +2869 / PTAT +2.76). Aristocrat became one of the most spoken about bulls in the breed when he topped the World Classic Sale at $620.000. Edn Ru Tequila Lilaes Lilac is now EX95 for her owners Jasmari Jerseys, PA. Her Guapo Daughter ~Lil Carina is now Ex92 and her Excitation Daughter ~Lil Rockstar is now Ex90 as well as herSultan daughter~ Lil Sensation,less then a week fresh is VG88 at 2yr and last but certainly not least her Grayson Granddaughter Freedom is VG87. View their Facebook page for updates and highlights. The two-time European champion Suard-Red Jordan Irene, at nearly 14 years of age has now received the ultimate score of EX-97. With over 100,000 kilos of milk in 7 lacations, this is a very special year for Irene. She became the first Swiss Red Holstein to receive the maximum score in their current classification system and is currently the highest classified Red & White cow in Europe. Tierneys Tequila Lada is now Excellent 95!! Tierneys Farm Jerseys, NY has the newest EX-95 Jersey, Tierneys Tequila Lada at 7-04. Lada is a Tequila from Tierneys Jade Leta (EX-91), Reserve Grand Champion, Eastern States 2009. Next dams include EX-94 x VG-88 x EX-95 Linda Lou x EX-93 x VG-85 x EX-92. Tierneys Impression Laura (VG-86), 1st lact. Mogul’s 2nd 95-point daughter, Kings-Ransom Mogul Cleo. 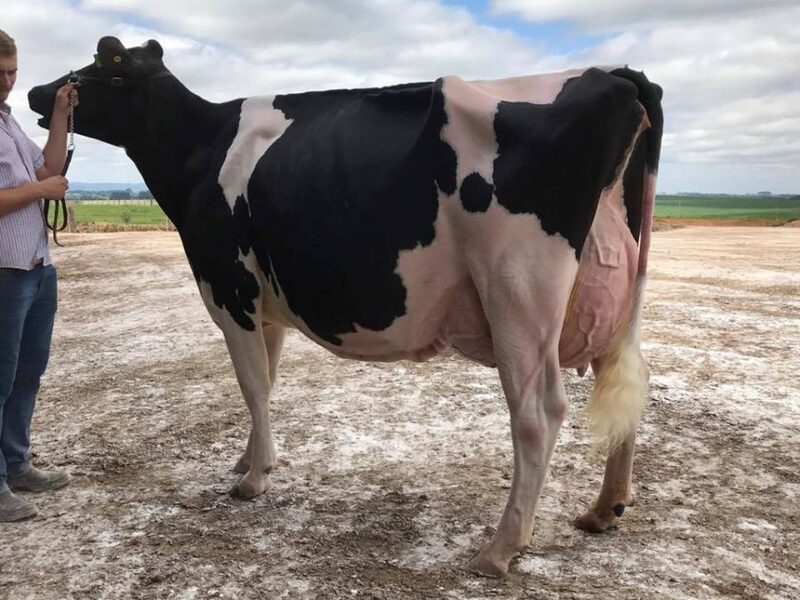 First, it was Kings-Ransom Mgl Cleavage who was Mogul’s First EX-95 daughter back in the spring, and then yesterday Mogul gained a second 95-point daughter….her full sister, Kings-Ransom Mogul Cleo. The mother of this exceptional pair of cows is a Goldwyn from Golden-Oaks Champ Rae EX-93, who was out of the Rubens sister to Debutante Rae. 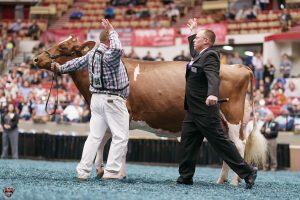 Northeast Wisconsin’s MilkSource Genetics has achieved an unprecedented Triple Crown. In 2014, the farm’s Blondin Redman Seisme became the first Red & White Holstein cow to achieve the milestone rating. In February, another MSG cow, Musqie Iatola Martha, became the youngest Jersey in history to achieve the 97 score. 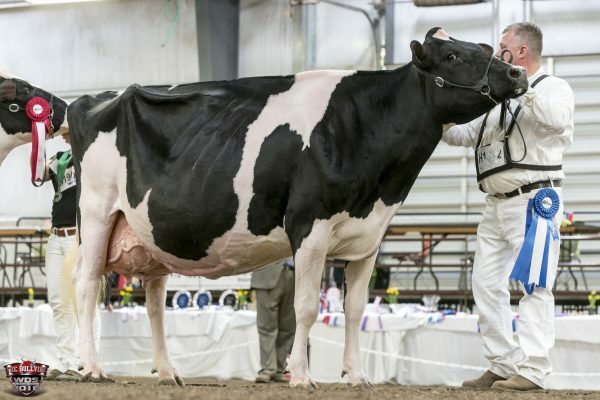 Now, Holstein Association USA has bestowed the landmark classification to Weeks Dundee Anika — a black-and-white Holstein. 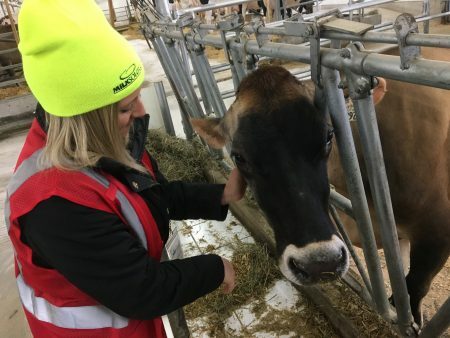 It is believed there are fewer than six cows living in North America with EX-97 scores and MilkSource Genetics is home to three of them. MilkSource Genetics Partner Jim Ostrom notes the milestone moment solidifies Anika’s global reputation. “She is an impeccably proportioned mature cow,” he said. “Anika, now almost 8 years old, was a good cow when we bought her as a Junior 2-year-old and, since then, she has continued developing beautifully. Bolstering her success, Anika also has transmitted her winning ways to offspring that have already begun making their mark in the show ring. For instance, Anika’s granddaughter, Milksource Dempsey Amour, just returned from the 2018 Wisconsin State Holstein Show as the Honorable Mention Junior Champion and 1st Place Fall Calf. “Anika’s not only cemented her own legacy, but she’s passing on those great diary genetics to future generations,” Ostrom said. Basking in her herdmate’s glow is another MilkSource Genetics’ cow, TK-Plainview-Ripley, which saw her own classification climb to EX-96 just days after being named Grand Champion of the State Show. 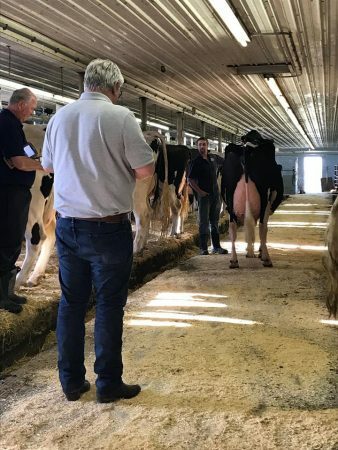 It was a busy week of classifications for Ferme Blondin of Saint-Placide, QC. Leading the way was AL-SHAR DEMPSEY ALISON now scored EX-96-2E for Blondin and partner Yvon Sicard. While in Vermont Walkerbrae Doorman Locket scored EX-95 for Blondin and partner Borderview Genetics. She is a daughter of Gloryland-I Goldwyn Locket (2E-94), a 10th gen VG/EX from the Roxys. 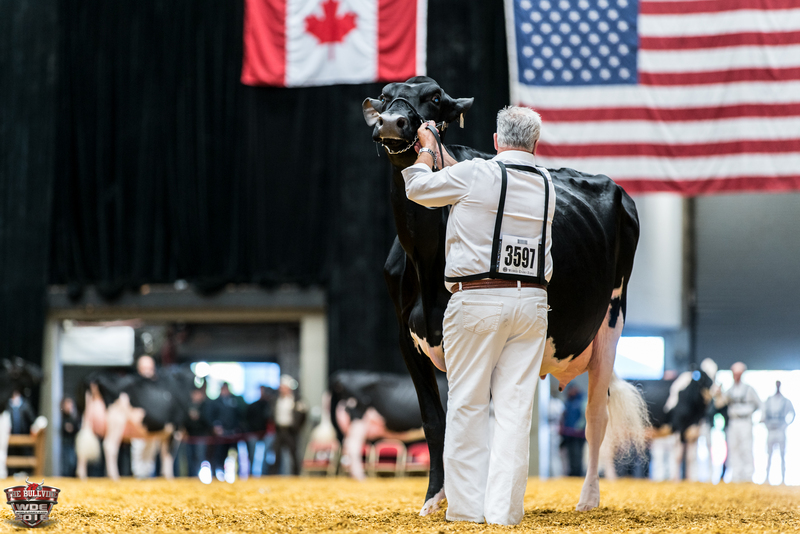 Doorman Locket was Nominated All-Canadian and All-American Junior 3yr Old in 2016 and was Grand Champion at the Vermont State Holstein Show in 2017. Meanwhile back home in Quebec they had success with the classifier as well, which included 25 VG 1st lactation cows. Siemers Holsteins has recently completed one of their three annual classification runs with some fantastic results, including 50 new EX and 75 new VG 2yr olds. Donor phenom COOKIECUTTER MOG HANKER-ET is credited with 11 of those new VG-2YR olds sired by five different bulls. 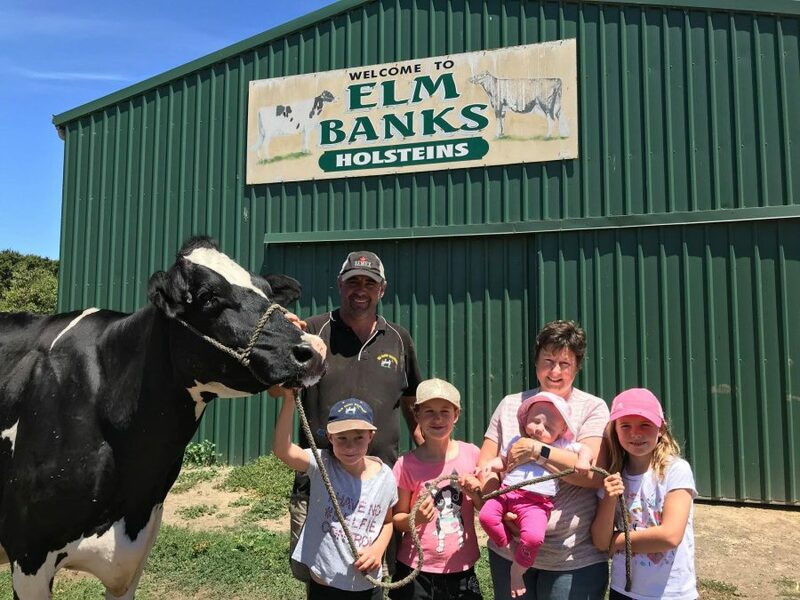 Siemers Holsteins is a 5th generation family farm in NE Wisconsin. RHA 2700 cows over 37,000M 1,400F 1,100P. Check out their website HERE. The Milking Shorthorn breed has a new EX-96 point cow in Kuszmar Arkansas Mud EXP 4E-E96, All-American Lifetime Merit 2017. She is owned by Kuszlyk Cattle Co., of Batavia, New York. Congratulations to the Kuszlyk Family! 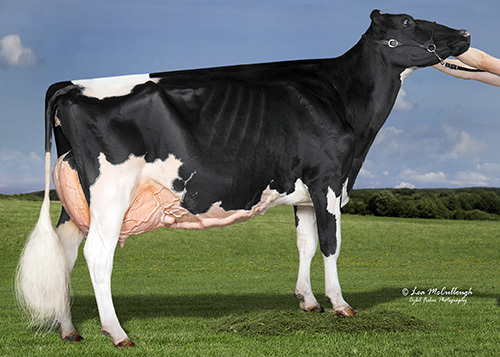 Priestland 4934 Goldwyn Ambrosia is now a 3rd Generation EX-95 for Priestland Farm of Northern Ireland. 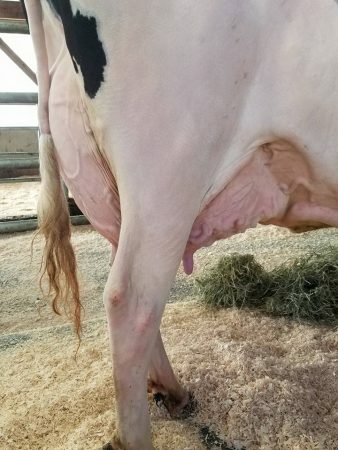 Producing over 70,000kg milk to date, the Goldwyn-daughter is out of EK-Oseeana Ambrosia EX-95, who is a direct daughter of the great Tri-Day Ashlyn EX-96. Hillpine Holsteins, WI, recently classified with exciting results, including Butlerview Aftersh April scoring EX-95. She was recently 2nd at Midwest Spring Show and is out of Brookvilla Jasper Aka (EX-92). As well as some exciting new very good two year olds! In early February, Michard Escale was the first cow in the French classification history to obtain the global score EX 97. 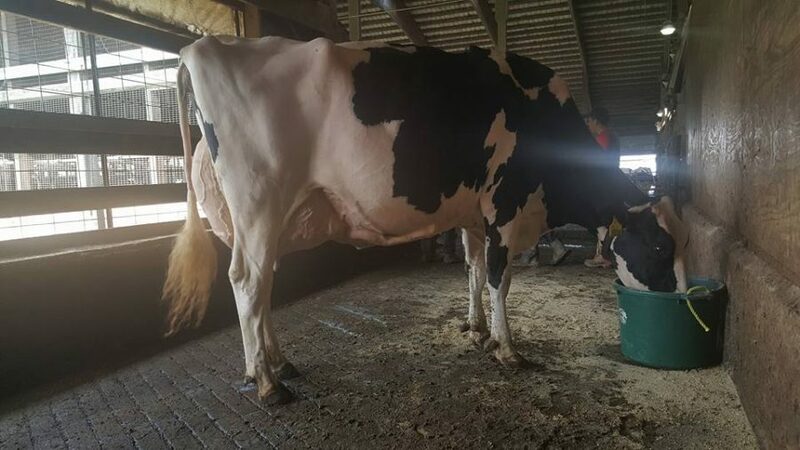 Classified by Didier Thareau, classificator at Prim’Holstein France, working in Côtes-d’Armor (Brittany), this cow in 6th lactation is owned by Gaec Michard (22). A score that many thought unreachable. Currently there are 1472 cows still alive to have obtained an EX global score in France. A figure that increases from year to year. To tell the truth, there are 1471 cows to be divided from the EX90 to EX96 score, and only one cow, Michard Escale (Damion x Jenus) belonging to Gaec Michard (22), has just been awarded February and for the first time in Prim’Holstein History, the outstanding score of EX97. 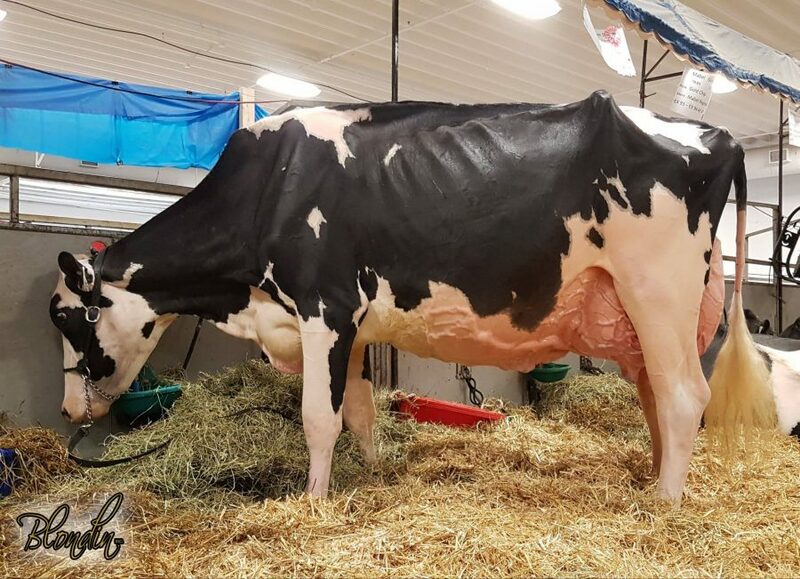 The newest member of the “95 Point Club” is AROLENE GOLDWYN DIVINE. Divine was the Reserve All-American 4 year old & Nominated All-Canadian for owners Budjon Farms and Peter & Lyn Vail, WI. They purchased Devine when she topped the 2017 Rosedale Sale of Excellence sale for $92,000. 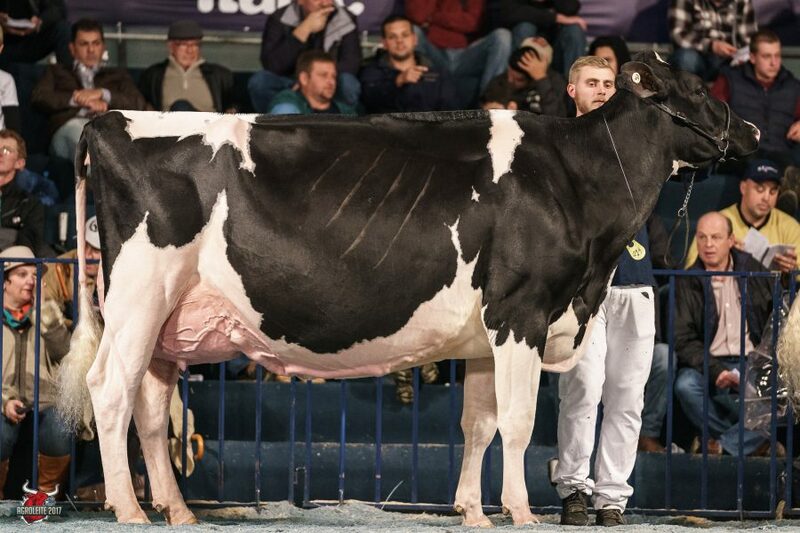 Fresh of her 2018 Swiss Expo Grand Championship, Rogy Goldwyn Ghardaia, has now been classified EX-95 in Switzerland for her owner Joe Demierre. 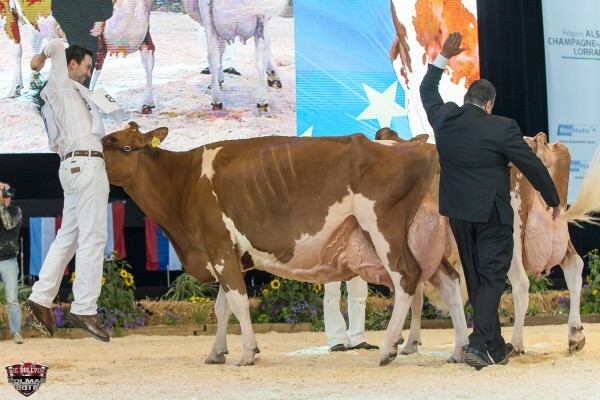 The Supreme Champion from the ’18 Swiss Expo was also the Junior Expo Bulle ’17 Grand Champion. Quality Holsteins, Vaughn, ON, recently had a small classification with exciting results. There were 2 new Excellents, 3 2E, & 1 3E. Other highlights include 3 VG-87-2yr olds, 1 VG-88-2nd calf and 2 new 94 point cows. Quality Goldwyn Fierce EX-94, is a 4th calf Goldwyn from Gibson Finsco EX-95 and Frantisco EX-96. 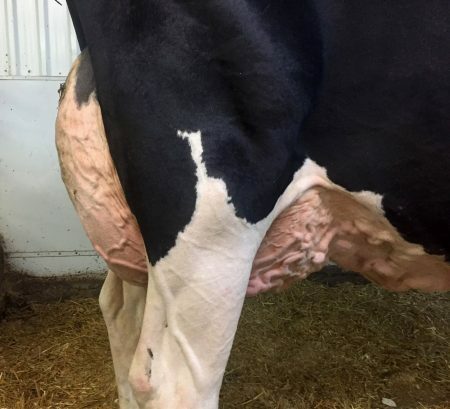 Quality Atwood Missy is now EX-94, with a 96 Mammary. Missy is out of Valleyville Rae Lynn EX-95. Visit their Facebook page HERE to learn more about the cows they are working with. At 6, Martha became the youngest cow — of any breed — to achieve a score of EX-97. 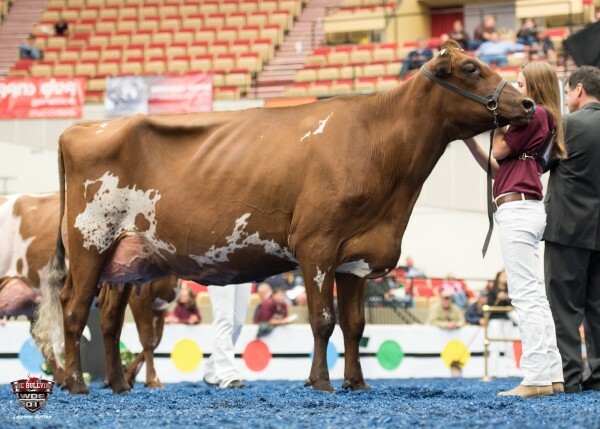 Musqie Iatola Martha – owned by MilkSource Genetics – is just the seventh Jersey in history to receive a EX 97 score from the American Jersey Cattle Association. Martha became the youngest cow — of any breed — to achieve that score. “I have said it before and I’ll say again, Martha is a ‘once-in-a-lifetime’ cow. I could spend the rest of my life trying to find an animal as amazing as her, and I wouldn’t succeed,” said Jim Ostrom, a partner in MilkSource Genetics, which co-owns Martha with Guatemalan businessman Fernando Jarquin. 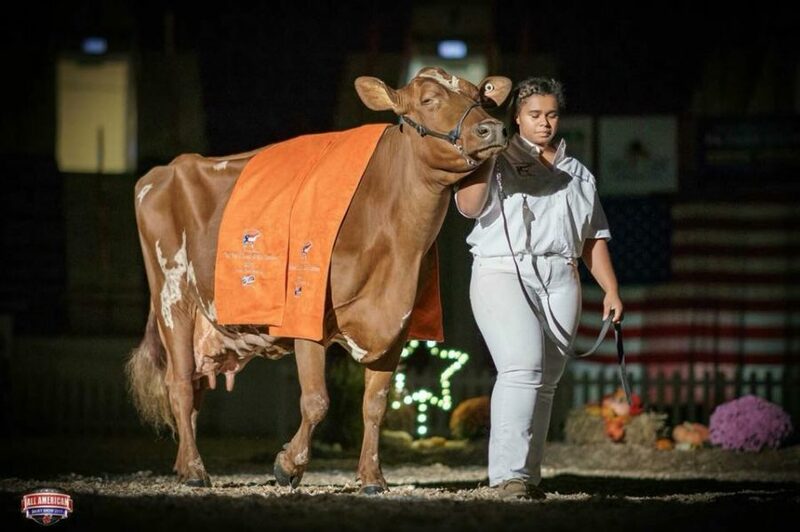 Musqie Iatola Martha – owned by MilkSource Genetics – is just the seventh Jersey in history to receive a EX 97 score from the American Jersey Cattle Association. 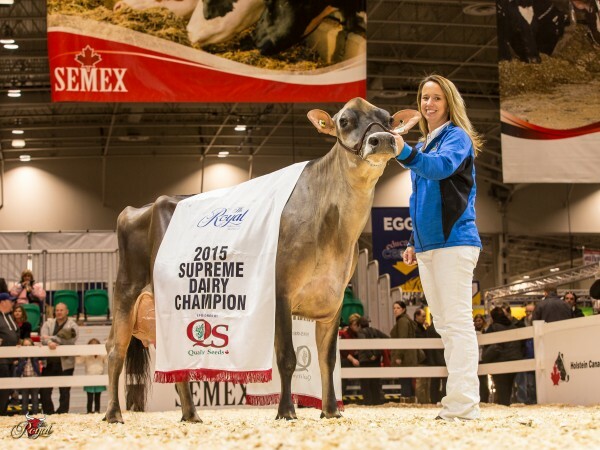 The decision culminates a historic, three-year run in international show cow competitions during which Martha was named a three-time consecutive Royal Agricultural Winter Fair Supreme Champion, two time World Dairy Expo Reserve Supreme Champion and WDE Supreme Champion. To put Martha’s achievement into more accessible terms, she is to show cows what Hank Aaron was to baseball and Secretariat was to horse racing. “Simply stated, one of the best ever,” Vosters said. Kings-Ransom Mg Cleavage-ET recently scored EX-95 for owner Jeff King of Kings-Ransom Farm, NY. She is the highest scored Mogul daughter and completes 10 generations of Excellent Roxys. 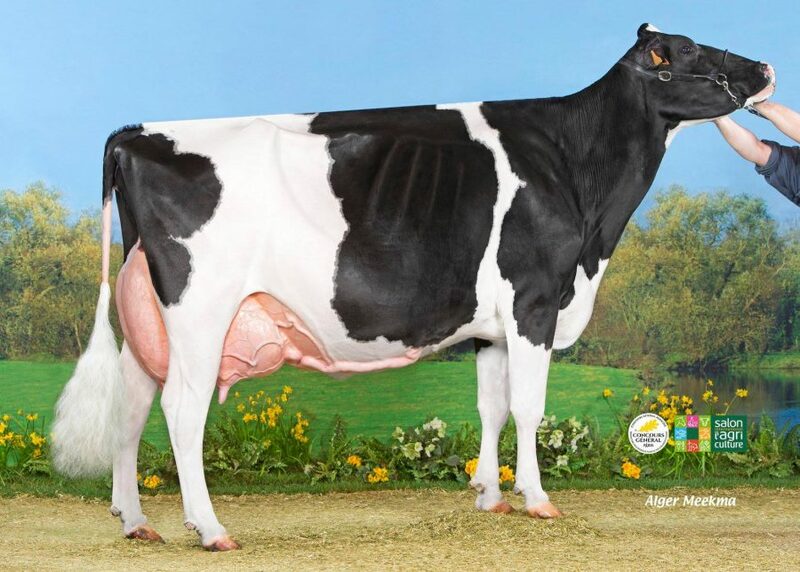 Comestar Lamadona Doorman, the former VG-89-2yr and 3-time All-Canadian nominee, has now scored EX-94. Her Sudan-brother Comestar Lautrust is the Nr.3 LPI sire, whilst her Mogul-brother Comestar Lineman ranks at Nr.9 LPI. Their dam is Comestar Lautamai Man O Man VG-87-2yr from the world-renowned Laurie Sheik family. First, it was Fairvale Morty Lady 51 and now it’s Windy Vale Contender Rose-ET, classifying EX95-2E following a revisit by Holstein Australia classifiers last month. Congratulations to the owners, Elm Banks Holsteins (the Gleeson family) in partnership with Declan Patten (Lightning Ridge Genetics) and Richard Quentin Hull (Eclipse Genetics). She was purchased at Bluechip Genetics’s ‘Big Bang’ sale in October 2016 and bred by Windy Vale Holsteins, SA. Pictured with Windy Vale Contender Rose-ET are Chris and Mary Gleeson, with daughters (l-r) Hannah, Stacey, Olivia and Chloe. Thanks to Holstein Australia for the photo! Holstein Association USA has released the lists of the top Holstein Breed Age Average (BAA%) herds for 2017 classifications. The BAA value provides a way to compare the score of a herd average to the average of the breed, taking into account age of the animal and stage of lactation. Herds participating in the Classic or Standard options of the Holstein Classification program receive an overall BAA for the herd. Several lists have been created to recognize members of all herd sizes and all areas of the country. Find the 2017 Overall Top 200 BAA Herds, Top 25 BAA Herds by Region, Top 25 BAA Herds by Herd Size, and Top 10 BAA Herds for Colleges & Universities on www.holsteinusa.com . 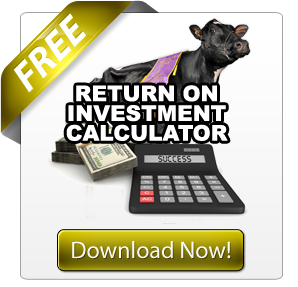 To appear on these lists, a herd must have at least 10 cows included in the BAA calculation. If a herd classified more than once during the year, only the most recent BAA was considered for inclusion. All eligible herds are automatically evaluated. The average BAA for all herds in 2017 was 106.5. Six herds had a BAA of over 114.0, and Matthew T. Mitchell of Tenn. earns the recognition of having the highest BAA in the U.S. last year at 116.5 on 10 cows. 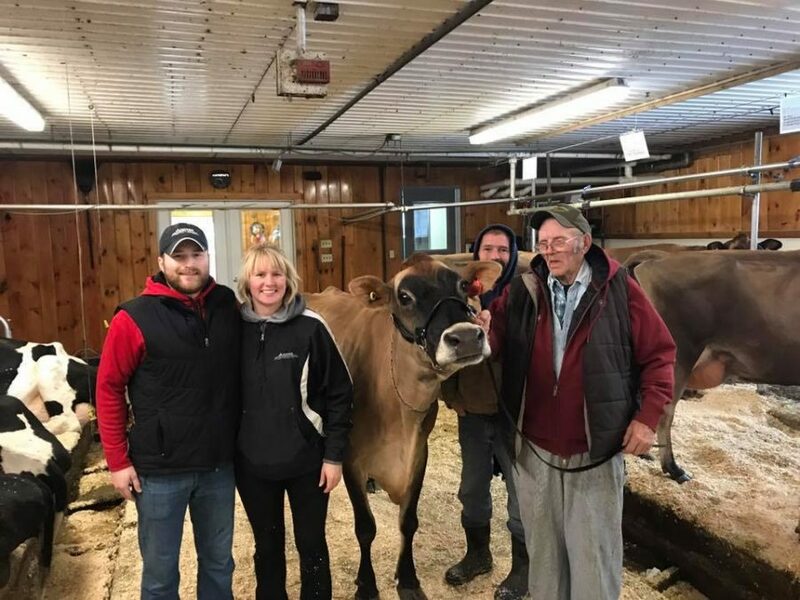 Rounding out the top five include Milk Source LLC, Wis.; Eaton Holsteins, N.Y.; Michael J. Garrow, N.Y.; Michael & Julie Duckett, Wis.; and Timothy M. & Sharyn W. Abbott, Vt.
Cedarcut Farm, owned by the Curtis family located in Cazenovia, NY, reports on a great classification day. 3X Expo Grand Champion of the International Junior Ayrshire Show Cedarcut Burdette Clove Colata has maxed out at EX-94 95-MS.
RIETJE BRAXTON first ever EX96 in Brazil. For the first time ever there is an EX 96 cow in Brazil and her name is RIETJE BRAXTON. Bred by the Kok family Rietje scored VG-87 in her first lactation. Giving birth to twins as well as a retained placenta did not stop the development of Rietje thanks to the care she received from her breeders the Kok’s and her now owners, the De Boer’s. 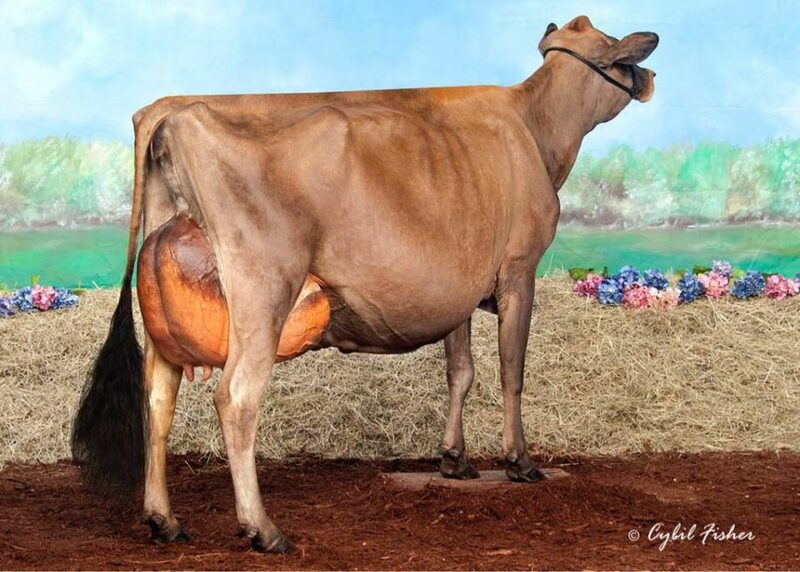 Rietje was a major champion in two of Brazil’s biggest exhibitions this year in her third lactation. And is now fresh 39 days in her 4th lactation when she scored 96 points. Elliotts Tequila Reese, now EX-95! Pictured LtoR: George Liberty, Shelby Crawford, Matt Hartle, and the infamous Ralph Gushee. Elliotts Tequila Reese just scored EX-95 for Juniper Farm Inc., ME. Reese has a long list of accomplishments including being nominated All-American and All-Canadian 4-Year-Old in 2015. She is a Tequila x Elliotts Vertigo Roxanne x EX-94 Deluxe x EX-91 First Prize x EX-91 Belles Expo. Visit Juniper’s website HERE to learn more about the animals they are working with. UNIQUE DEMPSEY CHEERS scores VG-89-2YR (max). She is the first cow in Canada to max score VG-89-2YR in her 1st lactation in over 2 years! ✔️The final revisit is with 3 classifiers. Two of them need to be Senior Classifiers and of those Sr. classifiers one must be a National Coordinator. ✔️Cheers actually had 3 Senior Classifiers and of them 2 were National Coordinators. Congratulations to her breeders & previous owners Unique Holsteins and also Jeff Stephens and partners. Congratulations to our partner on her Richard Villeneuve. And congratulations to the group of 3 Holstein Canada classifiers who made this special evaluation. CHEERS sells on December 19th at Ferme Blondin. Meadow Green Abso Fanny-Red-ET is the newest EX-95 cow in North America. She is now just the 15th red and white cow in the US to achieve such a mark. 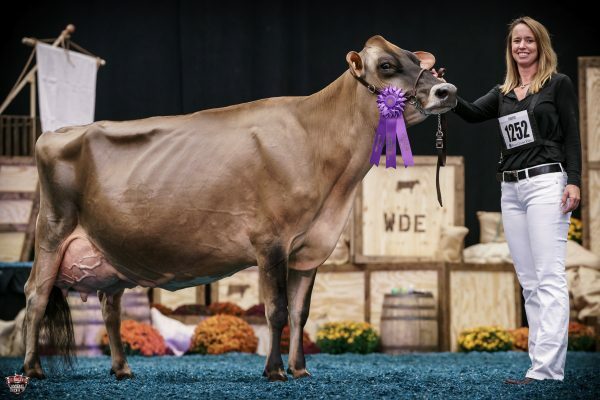 Fanny stole the hearts of dairy enthusiasts from across North America this year, earning Grand Champion honors at World Dairy Expo and the Royal Winter Fair. Fanny is owned by Triple-T Holsteins, Mike Berry, T & L Cattle, Frank & Diane Borba and Frank & Carol Borba, OH. Visit Triple-T Facebook page HERE to learn more about an exciting offering from Fanny in the Music City Celebration Sale! Oakfield Corners Dairy, NY, recently had a tremendous classification with 6 EX, 21 VG (13 were 1st lactation), and 43 GP animals. Here’s a full listing and some pictures. 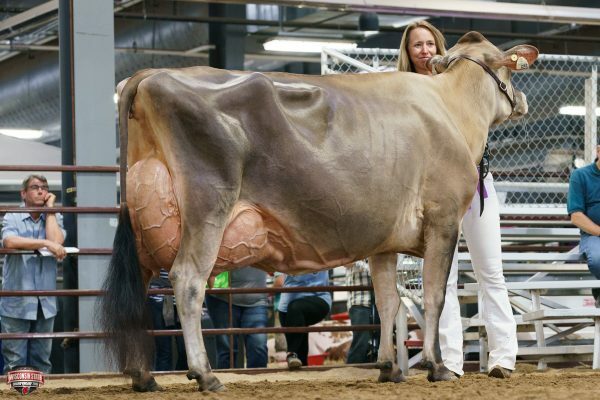 — OAKFIELD WB TIFFANY-ET, now VG-89 EX-91 MS at 2 yrs, 1st place Jr 2 and Intermediate Champion at the NY State Fair. Our most exciting young cow in the barn today!! — OCD DELTA 33343-ET, now VG-86 at 2 yrs, +2766 GTPI, sons in AI and she will be featured in the January ’18 Holstein International!! Australia used to be a limited hunting ground for North American breeders or investors looking for new cows and cow families. However, time has made the world a smaller place and the results are in that there is plenty to recommend Down Under when it comes to cows that can get “Up Over”. One herd that has drawn more attention than many is Fairvale Holsteins, in Tasmania. It towers over other Australian prefixes when it comes to breeding International Dairy Week (IDW) Grand Champions – even though it hasn’t shown in its own right since 2002, and has never shown in its own right at IDW. Fairvale Morty Lady 51 EX97 Grand Champion at IDW in 2011 and 2014 (for Linsand Holsteins and Matt Templeton in 2011, and Linsand Holsteins in 2014). 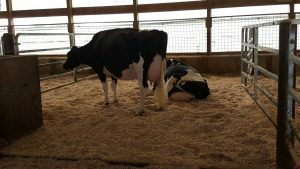 Fairvale, owned by Ross and Leanne Dobson, has bred and reared three cows that have won IDW Grand Champion five times for three different exhibitors between 2005 and 2014. Its achievement is more marked because their farm in Tasmania is separated from the mainland by 240 kilometres of ocean, and the first entries wearing a Fairvale prefix didn’t debut at IDW until 1998. Fairvale is a double Master Breeder herd, which achieved its second mantle with 6000 points to spare. 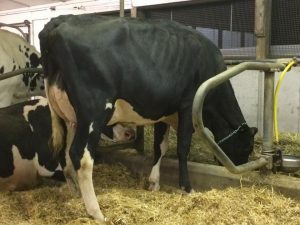 This year, Fairvale’s name went further than that – impacting in Canada – when a Doorman granddaughter of one of the two-time IDW Grand Champions Fairvale bred (Fairvale Jed Bonnie 94-ET – 2005 & 2007) won Junior Champion for her Ontario owners (Fraeland Holsteins and Jeff Stephens) at the Dufferin-Wellington County Holstein Show in September. This is made more significant, because a great granddaughter of Jed Bonnie in Australia (x Goldchip) was also Junior Champion at IDW in 2015 for Fairvale and Bluechip Genetics. Fairvale Jed Bonnie 94-ET EX90 – IDW Grand Champion Holstein 2005 and 2007. Owned by Leslie Farms and Fraeland Holsteins (Canada). Bonnie was Reserve Champion IDW 2014 for Fairvale Holsteins and Bluechip Genetics. She was never beaten in an in-milk class at IDW. It means two of Fairvale Jed Bonnie’s descendants – just one generation apart – have won Junior Champion in two hemispheres in the past two years. 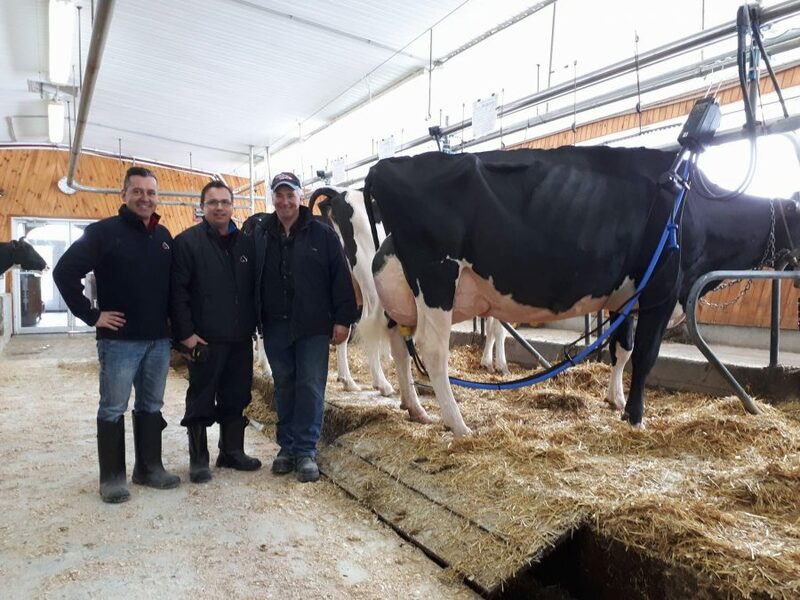 It is also worth noting that the Doorman is out of an EX95 Goldwyn at Fraeland Holsteins – a worthy achievement in itself for an Australian embryo to develop into a highly-classified brood cow in Canada. The Goldwyn will celebrate her 11th birthday next spring, and will soon be flushed to Dempsey. She just surpassed 100,000kg of milk lifetime. 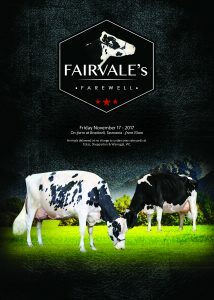 As Fairvale prepares to sell 275 of its best in Fairvale’s Farewell on November 17, the good news continues to roll in from around the globe on this herd. Doorman Bonnie (HM All-Canadian Junior Calf in 2016) is being prepared to show at The Royal this week. And, Doorman Bonnie’s maternal sister, Fraeland Black Beauty (x Bradnick), will sell fresh as an October milking yearling at Lot 63 in the Sale of the Stars. Meanwhile, in Australia, another Fairvale-bred exponent has hit the news. On November 9, Fairvale heard that they have bred the first cow in Australia to achieve EX97 points. Morty Lady 51 – owned by the Thompson family and US cowman Willy McKay – is 12 years old. The powerhouse, who was first singled out of Fairvale’s paddock by Lisa Thompson, and she is a popular peoples’ choice to stand at the summit of Australia’s classification points. And, Fairvale’s own final pre-sale classification on-farm this week included a new EX94 individual (who will sell), 11 new EX, 14 VG heifers (including several VG86 two-year-olds) and five VG88 second calvers (that’s one point off max points in Australia). Good news on classification days is not new to Ross and Leanne – they once had 15 Talent daughters score EX in a single day. They have always said they breed and develop the raw product. They rely on others to take those individuals to the next level. 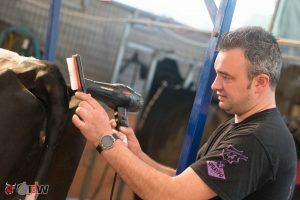 Five international names have bought into Fairvale animals – from the US, Canada, Spain and New Zealand. Steve Fraser and Joel Kietzmann were the first – both in 2004. Steve bought Fairvale Jed Bonnie 94-ET EX with Leslie Farms in 2004. She would go on to be a two-time IDW Grand Champion in 2005 and 2007. Joel Kietzmann, US, bought into Fairvale Leader Josie 5-ET EX93-2E, and she would win IDW in 2006. Fairvale animals have impressed five international buyers enough to make them reach into their pockets since the Tasmanian double Master Breeder started showing at IDW in 1998. 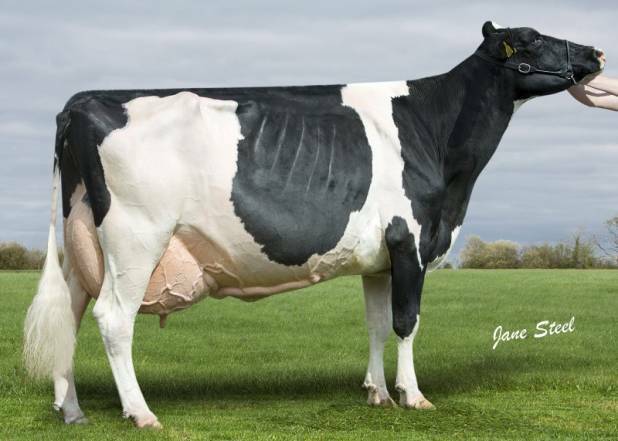 Among them has been Spain’s Alberto Medina (pictured), who bought into Fairvale Damion Melody 700 VG88 in 2015, the first year she showed after Bluechip, Toi Toi Genetics (NZL) and Averill Leslie (NZL) bought her straight from Fairvale’s paddock. Melody was twice an All-Australian finalist, and the All-Australian Four Year Old in 2015-2016 for the partnership. The Melody family has the biggest representation in Fairvale’s Farewell. 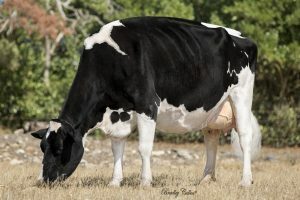 Alberto Medina, Spain, later bought into Fairvale Damion Melody 700 VG88, who won the four-year-old All-Australian in 2015-2016 for Bluechip Genetics, Averill Leslie (New Zealand), Toi Toi Genetics (NZ), and Alberto Medina (Spain) last year. Alberto’s ownership was cut short by Bluechip’s Big Bang dispersal before Melody could reach her full potential. Steve Fraser has been the one to establish a strong branch of the Bonnie family in North America. 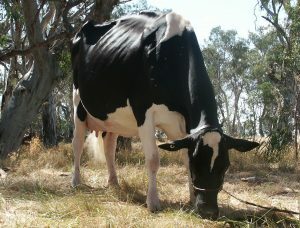 He had also seen Bonnie’s dam, Fairvale Lincoln Bonnie 55 EX-3E, win Honourable Mention Senior Champion at IDW in 2000. The Lincoln was the first Fairvale animal to show at IDW, and she was also the first partnership animal in what would become a successful 20-year alliance between Fairvale and Bluechip Genetics on Fairvale’s show animals. “The initial draw to [Jed] Bonnie was her conformation,” Steve said. “I remember seeing her win as a two-year-old and I always appreciated her. I was also at IDW in 2000 when the Jed’s dam [Fairvale Lincoln Bonnie 55] was Honourable Mention. 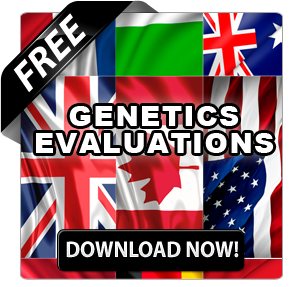 “So, the Jed’s pedigree and ability to breed also appealed to me to at least show or market offspring in Australia. “As far as buying something in another country, it is a big decision. For me it was quite easy at that time. I fell in love with Jed Bonnie and I had a tremendous relationship with the gang at Leslie Farms, where she was going to live. The ability to move embryos nowadays is quite simple, so purchasing in other countries is now quite intriguing. Steve says the Bonnies are Fraeland’s most reliable breeding family at the farm today. “You can never predict how things will go but as I said, with cows like Lincoln Bonnie and Jed Bonnie in the pedigree, your chances of breeding something are greatly increased. There is usually a timing factor to these stories, and having Goldwyn available at this point was a major key for us. Steve said they had marketed an Aftershock to Pierre Boulet. They had also sold a Sid daughter from the Goldwyn to their neighbours, who classified EX92, and Quality Holsteins recently bought an Alonzo yearling granddaughter of the Sid. “Ari Ekstein will tell you that he is very ‘interested’ and a fan of the Bonnies,” Steve said. 2005 & 2007 – Fairvale Jed Bonnie 94-ET EX (for Leslie Farms and Fraeland Holsteins, Canada). Bonnie was Reserve Champion in 2004 (for Fairvale and Bluechip Genetics). 2006 – Fairvale Leader Josie 5-ET EX93-2E (for Fairvale, Bluechip Genetics and Joel Kietzmann, USA). 2011 & 2014 – Fairvale Morty Lady 51 EX95-4E (Linsand Holsteins and Matt Templeton in 2011, and Linsand Holsteins in 2014). 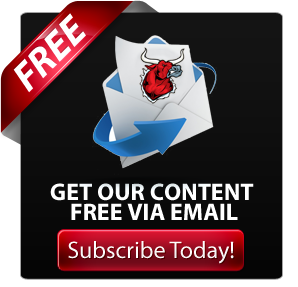 “It is a nice marketing edge. Also, for me growing up in the era of cow families correlating to certain farms, like Laurie Sheik (Comestar) and Elegance (Budjon) for example, it would be neat to have the Bonnies known as Fraeland’s lead family someday. Although, that will be hard since the offspring are so fancy and in demand. With the highest North American profile names now active in Australia – including Frank and Diane Borba – the timing has never been better for investing in Australian genetics. 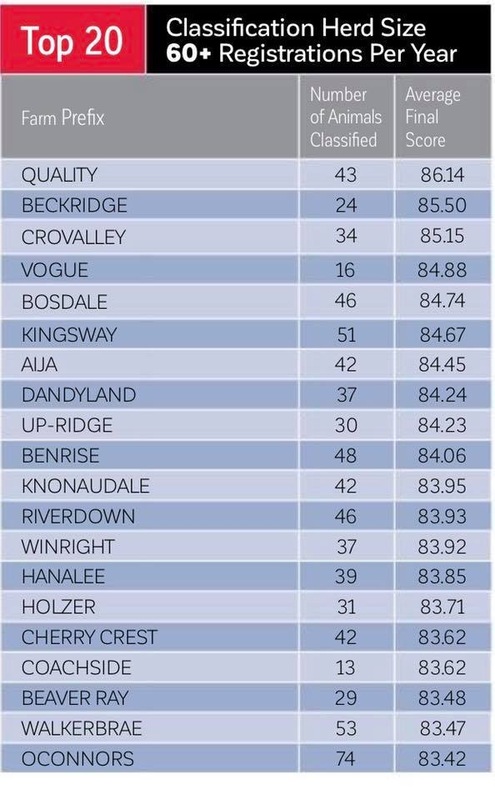 And, anyone who has travelled to IDW with an appreciation for Holsteins uniformly reports that Fairvale is the herd they’d most like the key to. If you are interested in buying, or need Australian connections to organise housing opportunities, please contact the sale manager, Dean Malcolm through Facebook or on email dean@crazycow.com.au or phone +61 417 302 037. 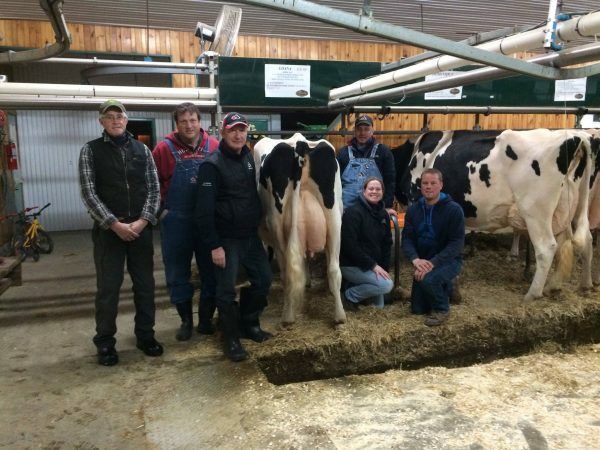 On October 19th Picston Shottle-ET (Ex-96-GBR-Extra-GM) recorded his 1000th Excellent classified daughter in Canada. She is Baertsch Shottle Barbara (Ex-90), a 7-year-old “Shottle” daughter bred and owned by Ferme Baertsch Enr., Thurso, Que. Shottle was a “Mtoto” son from Condon Aero Sharon (Ex-91-GBR-68*), the Canadian bred “Aerostar” daughter. Born and initially proven in the United Kingdom, “Shottle” was owned by Genus/ABS Global Inc. and died at 15 years of age in March 2015. “Shottle” was a Millionaire sire, a former number one Lifetime Performance Index (LPI) leader here in Canada and has had a major influence in Holstein breeding programs around the world. It’s official, the Holstein breed has another EX-96 cow! 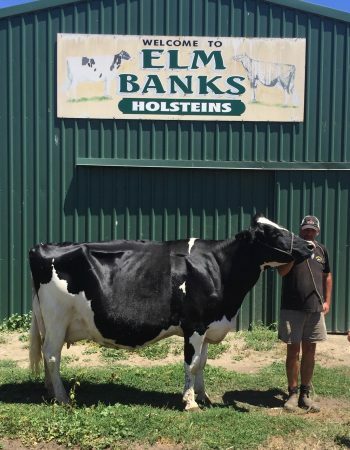 Team Durham Morgan-ET joined the EX-96 club for owner Michael Garrow, NY. Morgan topped the Lindale and Team Holsteins Dispersal in 2015, and was the anchor of the Team show string for years. Including winning 1st place Production Cow at The MIDWEST NATIONAL SPRING SHOW in 2016. Congratulations to her breeders Jeff Drendel and Kevin Kriegel of Team Holsteins, IL. Bella-Rosa GW Sara scored EX-95 yesterday for owners Jonathan & Alicia Lamb of Oakfield Corners in NY. She is a Goldwyn x EX Spirit x All-American Beaumond Splendid Spirit EX-95. Congratulations to her breeders and everyone that has helped her develop along the way!